Cameron Monaghan - Bio, Girlfriend, Age, Height, Net Worth, Is He Gay? Home Actors & Actresses Cameron Monaghan – Bio, Girlfriend, Age, Height, Net Worth, Is He Gay? Cameron Monaghan – Bio, Girlfriend, Age, Height, Net Worth, Is He Gay? Cameron Monaghan could discern his passion at a very young age and he was not going to deviate or digress from his purpose. He was also not scared to try both acting and modeling, knowing he had the talents flowing through his veins. The actor is popular for his role in the British comedy-drama series Shameless. Apart from his on-screen endeavors, there is so much more to know about the popular actor and model. Here are lesser known facts about him. He was born on August 16, 1993, to his mother Diane Monaghan. He took the last name of his mother who was a single parent. Reports have it that the actor celebrates his mother on Fathers’ day, as well as on Mothers’ day. Monaghan started to exhibit distinctive modeling skills at a very tender age of three, causing his single mother to negotiate with modeling agencies who soon signed him. He was also good with acting, participating in drama in his elementary school, Addison Mizner Elementary school. Cameron at the age of five was already on the cover of his first catalog. He was 7 when he did his first commercial. He continued with theatre production until 2003, when he starred in The Music Man, an ABC adaptation of The Music Man (1962). His role as ‘Winthrop Paroo’ greatly impressed the director of the movie who hailed him for his performance. After an impressive performance, Cameron started getting more roles. He was cast in the comedy series, Malcolm in the Middle in 2004. After earning critical acclaim, as well as some accolades for his role as ‘Chad’, he landed another role in 2005, in the comedy Ned’s Declassifies School Survival Guide. He went on to appear in series like The Mentalist, Criminal Minds, Numb3rs and many others on guest starring roles. Monaghan was further shot to prominence when he was cast as ‘Ian Gallagher’ in the comedy-drama series, Shameless in 2010. His role as a bipolar patient earned him massive critical acclaim from movie critics. For his performance in the fifth season, Monaghan earned the Critic’s Choice Award nomination for ‘Best Supporting Actor in a Comedy Series’. He reprised his role till the last season of the Showtime series. Cameron appeared on crime series NCIS in 2011 as a boy accused of the murder of his father. Also in 2011, he made an appearance in Rizzoli $ Isles. The following year, Monaghan appeared in crime series, Law & Order: Special Victims Unit, and continued to get more movie roles. the year 2015 saw him play the roles of twins ‘Jerome and Jeremiah Valeska’ in Fox’s crime series Gotham. Cameron Monaghan’s net worth is estimated at $2 million, and he has his movie stints to thank for it. For an actor who was initially earning about $500,000 this amount could become a trifling figure in the coming years, as the actor is just taking a step into the peak of his career. Personal Life – Girlfriend, Is He Gay? 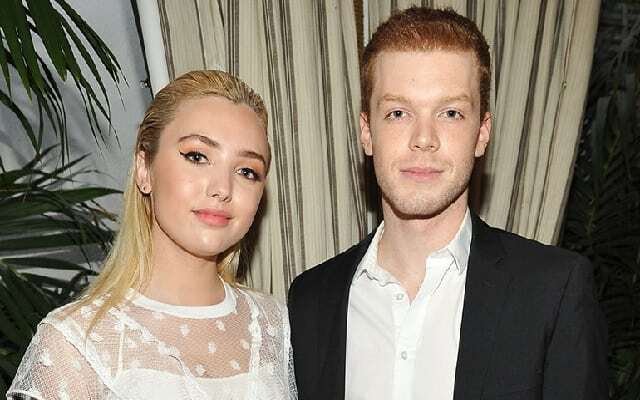 Cameron Monaghan may be very private with his personal life but no matter how hard he tries, he cannot keep it away from the prying eyes of the media. Given his gay role in the popular comedy series, Shameless; as well as in other movies where he effortlessly gave a good homosexual performance, there have been speculations about Monaghan’s sexuality. These speculations gradually rose to rumors, especially given the actor’s subtle and delicate look. But Cameron has boldly confirmed his sexuality on some platforms. See Also: Is Ian McKellen Gay? Who is The Husband or Boyfriend, What is His Net Worth? According to him, he only plays the roles but is not the character. The actor need not confirm or speak further, having been linked with different ladies. He is said to be dating his girlfriend Peyton List, whom he met in the early part of 2017. Monaghan was also previously in a relationship with Ruby Modine, his ‘Shameless’ colleague, in 2016. The actor was rumored in 2015 to have been in a relationship with British model, Sadie Newman although this was never confirmed by both parties. Cameron Monaghan may look delicate but he surely has an appealing athletic body build, no wonder the ladies love him. With a height of 1.82 meters (182 cm), he surely passes for a tall man and has a proportional body weight of 69 kg (152 pounds). His chest which measures at 39 inches, perfectly supports his Biceps which measure 35 inches.